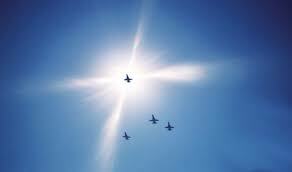 Who flew the T-38 “Missing Man” formation at the Challenger Memorial service at JSC, 31 January 1986? President Ronald Reagan at Memorial Service for Challenger Crew. 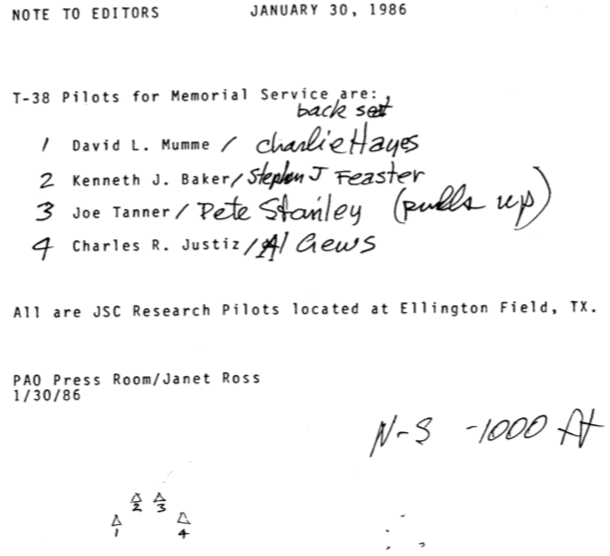 On January 31, 1986 I attended the memorial service at Johnson Space Center for the STS-51-L Challenger crew. 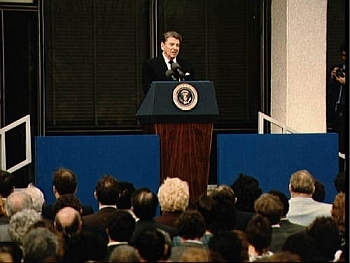 I vividly recall the moment when President Reagan ended his remarks and a formation of NASA T-38 Jets flew over the assembly, with one pilot pulling back on the stick at just the right moment to scream straight up out of sight to form the Missing Man formation. There is a catch in my throat now just recalling the memory of that powerfully emotional moment. No luck so far. This may not have great historical significance for many. I understand that. For me, it's personal. NASA T-38's performing Missing Man Formation. This isn't an answer, but a proposed route to one. Which contains his contact information. He seems like a nice guy, so try here first. Not the answer you're looking for? Browse other questions tagged united-states 20th-century spaceflight nasa or ask your own question. Did most colleges in the United States have semesters that began in September and ended in January during the 1890s? Who said “Lafayette we are here!”? Who is this person on the picture? Did the USSR invite other astronauts of Apollo 11 besides Armstrong? What was the first regular airline service to pass low over urban areas? Why did United States stop celebrating The Eighth(January 8) as a federal holiday? Who is the great Epstein? Who, if anyone, was the first astronaut to return to earth in a different vessel?